The HELIX 12 CHIRP GPS G3N is one of the largest units from the “HELIX” series released by Humminbird in 2019. It’s a fish finder and chartplotter combo, offering Dual Spectrum CHIRP sonar, GPS, and the Humminbird Basemaps. It also includes the new High CHIRP transducer. For reference, this is the Humminbird part number 410900-1. 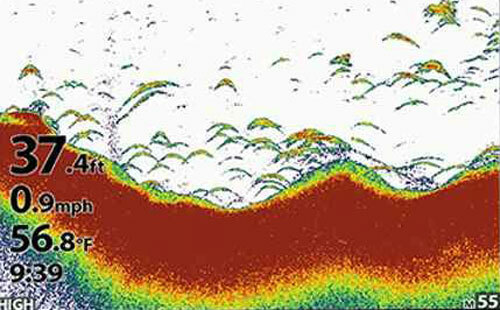 The HELIX 12 CHIRP GPS G3N is one of the Humminbird fish finders that only offer traditional Dual Spectrum CHIRP sonar. It does not support Side Imaging or Down Imaging. However, since it’s a G3N unit, it is compatible with the 360 Imaging transducers. Also, as base frequencies, it supports 50 kHz, 83 kHz, and 200 kHz. The unit comes with the XNT 9 HW T transducer, the one that is also included with the HELIX 9 CHIRP GPS G3N or the HELIX 7 CHIRP GPS G3N. This is a High-Frequency CHIRP transducer which allows the system to operate in a CHIRP frequency range of 140-240 kHz. The unit makes available three sonar modes. These are Narrow Mode (180-240 kHz), Wide Mode (140-200 kHz), and Full Mode (150-220 kHz). The Narrow and Wide Modes are fixed (for the specified frequency intervals), while the Full Mode is adjustable (the 150-220 kHz interval is set by default). The transducer uses conical beams for all the CHIRP modes. For the Wide and Full Modes, their coverage is 42°, while for the Narrow Mode, the beam offers a coverage of 25°. Evidently, it’s recommended to use Narrow Mode when you want more focus, and the other modes when you want more coverage. The maximum depth capability of this fish finder system with the included transducer is 1,200 ft (365 m) when using Wide Mode. However, the unit also supports 50 kHz frequencies. Therefore, if you pair it with a 50 kHz CHIRP transducer it should be able to scan depths up to 3,500 ft (1,066 m). The transducer integrates a temperature sensor and the unit has a Temperature Graph function. These can be quite useful if you’re looking for top-water currents. The transducer has 20′ (6 m) of cable and comes with a transom mount only. The trolling mount is optional. The unit offers the full range of standard sonar features. Among them, we can count SwitchFire, Selective Fish ID, Circular Flasher, Real Time Sonar, Split Zoom, Bottom Lock, Depth Alarm, Fish Alarm, and more. A Temperature Graph function is also included. Plus, the unit has Sonar Recording and Sonar Rewind, but in order to use these, you will have to insert a data card into the unit. Like all the other new HELIX units, the HELIX 12 410900-1 model is preloaded with the Humminbird Basemap. This chart platform offers maps based on the NOAA official charts covering more than 10,000 U.S. lakes with 1′ depth contours. They also provide plenty of other information, including docks, camping grounds, marinas, hotels, buoys, spot soundings, hazards, main roads, and more. Of course, the unit is compatible with Navionics and LakeMaster charts, as well. 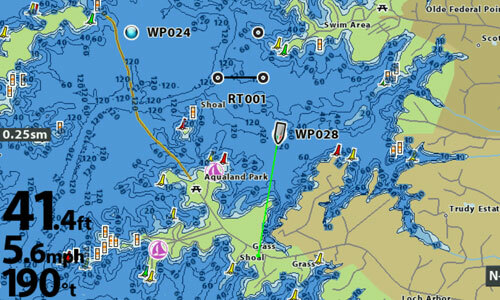 It supports Navionics+, Navionics Platinum+, LakeMaster, LakeMaster Plus, and also SmartStrike fishing charts. AutoChart Live is also included. This feature uses the 2D sonar information and the GPS information in order to draw and overlay the depth contours over your maps. Therefore, if the Humminbird Basemaps or the maps that you currently use do not offer satisfying detail for your own lake, you can always use AC Live to create your own personalized fishing map. AC Live can record up to 8 hours of mapping. However, you can always expand this capacity by a Zero Lines contour SD card. The unit has a 10 Hz internal GPS receiver. This means it can provide position updates up to 10 times per second. Therefore, the movement of your boat appears on the unit’s display in real-time, without jumping from a point to another. The unit’s GPS system can also use WAAS, EGNOS, or MSAS position augmentation. Plus, it has a GPS speed function, so it can calculate and display the speed of your boat. The unit allows you to create routes and record your trails. It can save up to 47 routes and 50 tracks (with up to 20,000 points per track) in its memory. It can also save up to 2,500 waypoints for which you can personalize with a wide array of icons. In terms of external navigation instruments, the unit can receive data from GPS heading sensors or AIS units. It also supports Radar and Minn Kota i-Pilot Link. 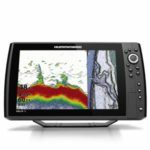 The Humminbird HELIX 12 CHIRP GPS G3N features a 12.1″ diagonal display with a pixel resolution of 1280H x 800V. It has a 16-bit color range and adjustable LED backlight providing superior readability in direct sunlight and from angles up to 85°. It also has IPX7 waterproofing which means it can withstand incidental water exposure such as rain, splashes, and even complete immersions in freshwater. The classic Gimbal mounting kit is included with this unit. The in-dash mounting kit and the sun cover are optional. The unit’s interface is keypad operated. In other words, it does not have touchscreen technology; its operation is done exclusively from the keypad on the right. Or, you can pair it with an RC2 Bluetooth remote to control it from distance. The RC2 remote control is also optional (not included). Since it’s a G3N unit, if offers superior networking capabilities compared to the G3 units. To begin with, it is Ethernet and NMEA 2000 compatible. This being said, you can connect it to the boat’s already existent grid so it can receive data from other boat instruments such as Radar, AIS, i-Pilot Link, etc. It also has wireless connectivity. Therefore, you can sync it with your phone or tablet via the FishSmart app to download software updates, charts, and even get notifications from your phone on the display of the unit. As opposed to the units with the smaller display, the HELIX 12 CHIRP GPS G3N has a dual SD card reader (not microSD). Thus, you can use up to two map card sources, or a map SD card and a data SD card at the same time. The in-dash mounting kit is not included. The HELIX 12 CHIRP GPS G3N is a fish finder and chartplotter featuring Dual Spectrum CHIRP sonar, GPS, Humminbird Basemap, and AC Live. It includes the XNT 9 HW T transducer which comes with a transom mount. It is Ethernet and NMEA 2000 capable and thus it supports Radar, 360 Imaging and i-Pilot Link. It also has wireless connectivity and a dual SD card reader. Although it does not have Side Imaging or Down Imaging, it’s a fairly decent unit, great for both freshwater and saltwater.